There are three separate well-appointed houses on Little Whale Cay offering the guests the ultimate in privacy and luxury. Each Villa is individually designed and is fitted out with luxurious furnishings and linens and state of the art appliances. For more information on the accommodation available on Little Whale Cay please click on the Resort Accommodation link above. Little Whale Cay is located 140 miles southeast of Florida’s Fort Lauderdale in the Berry Island chain of the Bahamas. The island has a private 2000ft airstrip which is suitable for light aircraft. Customs can be cleared at Chub Cay which is an entry point into the Bahamas and has an airstrip that is suitable for a private jet. Little Whale Cay is a five minute onward flight from Chub Cay in a light aircraft or clients can be collect by one of Little Whales Cay private vessels. Little Whale Cay is a secluded private island in the Bahamas which is available for hire for your dream vacation. The setting promises an unforgettable Caribbean Island experience. Situated in the Berry Islands, in the heart of the Bahamas, this private luxury island paradise offers lodging for up to 12 guests in 3 luxury villas. Little Whale Cay is easily accessible by plane from Florida or Nassau and is rich in Caribbean charm and local Bahamian history. This exclusive private Island oasis offers a sea-view infinity pool, gym, tennis court, private airstrip, a harbor and flotilla of boats for fishing, cruising or water sports, plus a full compliment of 13 staff including a masseur and a personal chef. 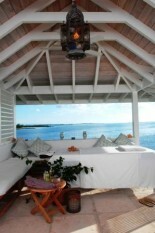 Little Whale Cay offers you every opportunity to indulge yourself during the stay. The Islands personal Chef will prepare meals and snacks to your personal preference using delicious fresh and organic fish, meat and vegetables. All diets can be accommodated as supplies are flown into the island regularly. Little Whale Cay also offers the perfect opportunity to soak up the Caribbean sunshine with a balmy 9 hours of sunshine a day from November through to May, giving you ample opportunity to enjoy the islands private white sandy beaches, tropical gardens and crystal clear waters. There are many activities to choose from on Little Whale Cay. A myriad of water-sports including fishing for bill fish and bone fish on the islands two private power vessels, waterskiing and doughnut riding, wave riders, dinghy sailing, and kayaking to name a few. The staff will also help you organize day trips to a number of destinations, which are in easy reach of Little Whale Cay. Spa treatments can also be arranged by the islands private masseur. Please click on Island Activities to see these in more details.